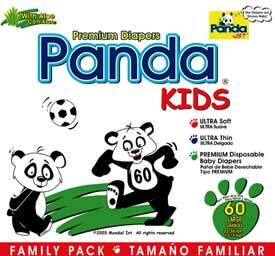 Panda-Kids Premium Baby diapers just another addition to our full range of value disposable baby diapers. First quality, diapers great for export directly at manufacturer wholesale prices. Baby diapers with Aloe & Vitamin E, We manufacture a first quality Discount alternative diaper for the world. Our diaper line is manufactured in the USA and is sold to local distributors across the globe. Wholesale Discount Economy Manufacturer of Baby diapers. We have to lowest prices in the USA for Suppliers of a first quality baby diaper. Above prices are for Container size orders. 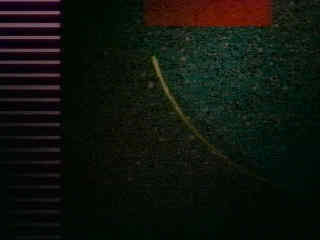 Private Label agreements including, custom frontal tapes. Contact us for details. Bulk wholesale diapers packed in clear or Packaged in your own brand bags as follows: E-mail us for information. 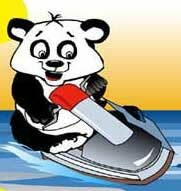 Bundies and Panda-Kids diapers offer top quality and brand name-equivalent performance at an economical cost. Now available from Mondial International. Panda-Kids ® Premium Baby Diapers offer all the features of national brands at a lower cost. A soft cloth alike, stay-dry cover sheet keeps the baby dry while the super absorbent core pulls moisture away from baby and our Aloe Vera extract helps provide a soothing effect for even greater dryness. Stand up outer and inner leg cuffs with multiple strands of elastic prevent leakage. Refastenable Tapes either Sticky or New Velcro style assure re-adjustment at anytime....... Our Diapers are "Groovy baby"
The entire line of Panda-Kids® & Bundies Baby Diapers are available for private label. Everything in a Disposable Overnight Baby Diaper! Decorative Logo on every Diaper Frontal band.